Has anybody bought and used a code 0 on their boat? If so was it with the Hanse sprit? My neighbour got a 65sqm Code 0 from Wendel & Rados in Greifswald. It is on the normal bowsprit with a dyna One support strip to the last bolt of the forstay chainplate. It is mounted on a Bartels endless furler with a double dyna One forstay. They are very happy with it! 65 m2 on a 370 is not very big. Perhaps it was a smaller boat? we have a 375 and just ordered a code 0 with Facnor roll system. What do you mean by 65m2 on a 370 is not very big ? We are talking about a code 0, not about a gennaker ? Maybe there is confusion with a gennaker ? I have a Code 0 from North Sails. Very happy with it. I could sail with it with winds as low as 3-4 knots, and up to 12-13 knots. The ideal complement to the self-tacking jib when unsufficient in light airs. I have a 78 sqm Code0 with facnor endless furler. It's the perfect sail for the 370. The quotes I have from Doyle, Evolution and North are all for sails in the range of 95-110 m2. These are about the same size as my asym spin. If you use a furler what kind is it and would you recommend it? I think a 90sqm Code 0 doesn't make any sense. 70sqm is max from my point of view since above 12kn. true wind the self tacker starts working also (when it's sheeted properly). I got a quote from Selden and it seems that the 370 is just between FX15 and FX25. The size of the sail is not the issue (although they give an indication). It is the righting moment and the kind of sail (Gennaker or real Code 0) which causes the loads on the stay. If I look at your pictures above it is a normal 1:1 halyard which means the loads are limited also. Selden says that with a typical 2:1 Code 0 halyard (which nobody on our boats might have) the bigger one is needes and you could also not go too high above the forestay to save the masthead. I think a light Kevlar Code 0 with a torsion stay and a 1:1 Halyard which results in a not perfect hight upwind is still the best sail for a Hanse 370. You would still need a Runner Gennaker with around 110sqm for fast downwind sailing. By the way: my neighbour has a 370 and not a smaller boat. We have a Code 0 from Doyle (they call it UPS = Utility Power Sail) in our Hanse 371. The sail is made of 2.2 oz nylon, 62m2 in size and made in Bartells furlel. We use it in a gennaker pole of Hanse design. That's short but takes the sail a bit further from the bow. 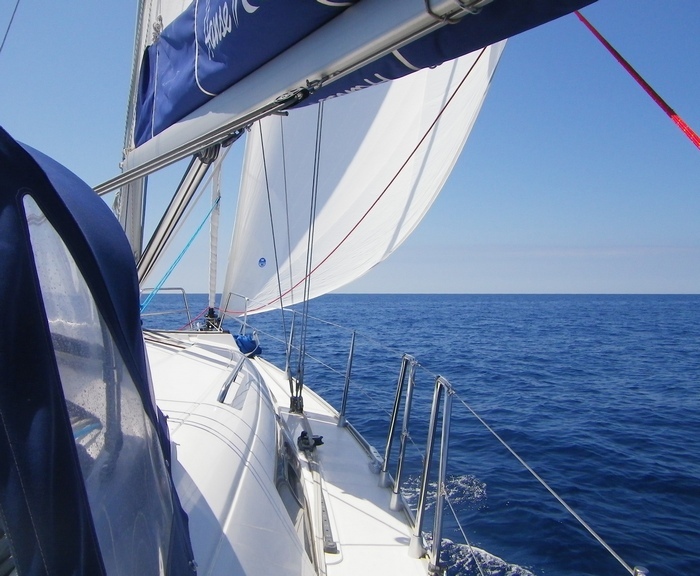 The idea of having the sail is to get rid of genoa and change over between genoa and jib. We can use only self tacker to head wind or in tough weather and if wind is light or direction is down from up wind we can use code 0. Based on our experience from the summer the sail works well and gives us the wanted extra power and speed in light breeze. We have sailed up wind in angles 35 degrees apparent in 2-3m/s wind. Sail is like a large genoa allthough our sail looks very small being 62m2 and doesn't come any further than what genoa would do. I had doubt is the sail as large as the sailmaker promised but seeing the picture here it looks the same. Note that tacking up wind is difficult and can't be done as with a genoa. 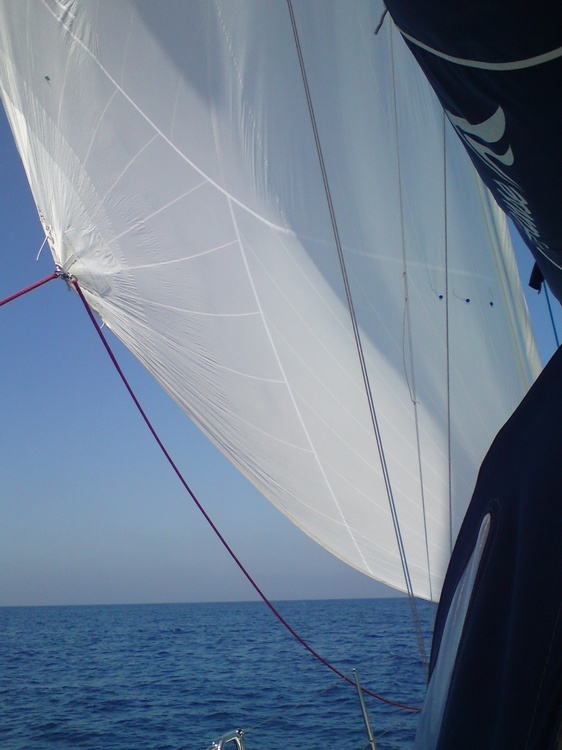 Sail is very light from nylon and in tacking up wind it has to be rolled in to make it safe. Now comes the difficult part: if you go up wind and try to roll the sail in it doesn't work like a normal furler for genoas. The sail spins around and try to come out all the time pushed by wind even if rolled in. You may need to loose the tighten front line ( going up wind requires that to be very tight) and sail down wind before you can get the sail rolled in. Therefore having this experience I would consider to have a nylon Code 0 with a snuffer. That may work better, though doesn't either allow you to tackle up wind. They also make these sails from very light laminate and those definitely have to be in the furler. I wanted to have a laminate sail but they do cost as twice as nylon sails. Overall I'm satisfied to the sail just taking into account its limitations. The quotes all say they will use CL 15 (Contender) or ZL 04 (Polyant??) cloth both are mylar laminates (I think) They are very light and expensive . Thanks for the advice I will consult more with my sail makers. By the way I sail on Lake Huron and the wind is always, it seems, either feast (> 20 knots) or famine (< 10 knots). I have a Kevlar genoa that is about 40-45 m2 but it is heavy and will not hold shape in light air. Hence my interest in the code 0. Last year we got crushed in the Port Huron MAc race by a 1980 Morgan (10m) with a code 0 in < 10 knots. This should not have happenned. So the sail is intended for very light air use only. I also have a laminate self tacker designed by Evolution sails (in Toronto)that is like a # 3 about 25-30 m2. It has a roach with vertical furlable battens but still works on the self tacker. It works great (above 15 knots). Think of the stock head sail but with another 5-10 m2 of area.